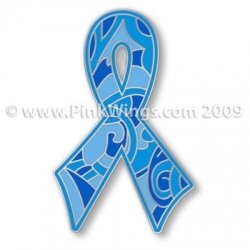 Blue Paisley Ribbon pin (prostate and colon cancer awareness). I have brought in this Blue Paisley Ribbon Pin in honor of my late father who fought the disease for 4 years. Sadly, my dad passed away at the end of February, 2009. He died peacefully in his sleep while vacationing in Palm Springs at the age of 80. If you have an event for Prostate or Colon cancer and would like to purchase these pins in bulk, please email me at czinszer@yahoo.com and I can order more for you.